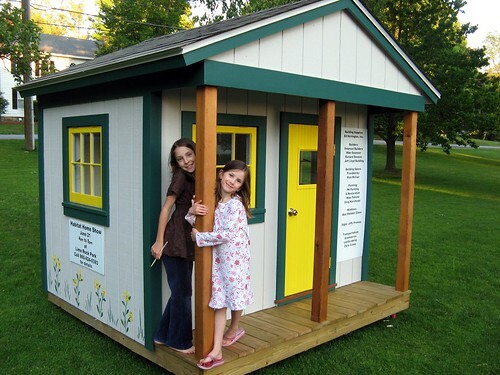 habitat playhouse, originally uploaded by jahansell. My daughters are helping show off a very innovative advertisement for tomorrow's fundraiser for Habitat for Humanity of NW CT. Volunteers built a full-size play house and displayed it at various sites around the area, including, for a while, the Sharon Green, where we encountered it. Habitat has built several houses over the years for working class folks, the backbones of the community who might never be able to buy a home, even now when spiraling prices have at last started to fall off a bit, and these fundraisers help them carry on this important work. The event is tomorrow afternoon at Lime Rock Park, and features an art show with the work of many interesting local artists, and a live auction. More info here!